NASA'sfinal shuttle flight to overhaul the Hubble Space Telescope will fly only whenit is safe to do so, the agency's science chief said Tuesday. Alan Stern,associate administrator for NASA's science mission directorate, said the agency'splannedAugust launch to Hubble by seven astronauts aboard the Atlantis orbiter isdependent on the success of three other shuttle flights to lift off in upcomingmonths. The shuttlemust first haul a new European laboratory to the International Space Station(ISS). But that flight — slated to launch no earlier Jan. 24 — has been waylaidby fuel sensor system glitches since December and faces a likelyslip to early February, NASA officials have said. "Ourwatch word in all this is safety," Stern said during a meeting at theAmerican Astronomical Society in Austin, Texas. "Hubble is perfectlycapable of taking care of itself, and if the servicing mission needs to be in September,October, later in the year - whenever - we're going to do it the safest way wecan as an agency. Safety is going to be first." Targetedfor an Aug. 7 launch, Atlantis and its STS-125 astronaut crew will fly the fifth servicingmission — dubbed SM-4 — to Hubble since the observatory's launch in 1990. But themission is not without risk. Unlikeshuttle astronauts on ISS construction flights, Hubble-bound spaceflyers willnot be able to return to the space station should their spacecraft suffer majordamage. Instead, another NASA shuttle is expected to be ready to launch arescue mission within about 25 days of any serious problem aboard Atlantis,NASA officials have said. In fact,the agency canceled the Hubble servicing mission outright after the loss ofseven astronauts and the spaceshuttle Columbia during atmospheric reentry in 2003. An errant piece offuel tank foam damaged the Columbia's left wing-mounted heat shield duringliftoff, leading to the accident. "Thedecision not to fly the Hubble servicing mission following the tragic loss of Columbia was based on an assessment of risk, given the circumstances at the time,"said astronaut John Grunsfeld, lead spacewalker for the upcoming Hubbleservicing mission. Since theagency resumed shuttle flights in 2005, NASA engineers and astronauts have repeatedlyproven their ability to use new inspection techniques to ensure orbiter heatshield health on seven successful missions. It was based on the success ofthose techniques that NASA revisited, and ultimately approved, Hubble's finalservicing flight in October 2006. "Wefelt that the risk of this Hubble mission is comparable to the risk of, say, anSTS-115 [mission], which we flew post-Columbia," said Grunsfeld, who willmake his third trip to Hubble and fifth spaceflight during the servicing flight. 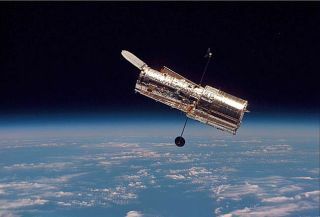 Without onelast servicing mission, Hubble could physically last until 2011, but thissummer's flight is designed to extend its science-producing lifetime through2013. Plannedupgrades for the orbital observatory include fresh batteries and gyroscopes;unprecedented repairs to its main camera and a spectrometer; as well as theinstallation of the new Wide Field Camera 2 and Cosmic Origins Spectrograph. Ifall goes well, the STS-125 mission would leave Hubble 90 times more powerful thanthe original telescope that launched in 1990. Hubble hasproven itself to be a watershed astronomical tool for researchers and thepublic-at-large, said Grunsfeld, a physicist. But the agency has not shirkedsafety to support that science, he said, as proven by the repeated delays forNASA's upcoming shuttle flight so engineers can fix a redundant, but vital,system. "Weneed to fly safe, that's our number one job," said Grunsfeld. "Istill believe that Hubble, and Hubble science and Hubble program ? is stillsomething that's worth risking my life for, and I know I have a crew of sixother crewmembers who believe that as well.